After tedious planning, packing, and juggling schedules, hotels, flights, and horse transports, we have made it to our very first destination in California. The stress of driving the pass with the obedient horses and clear roads faded quickly. We were forced to leave much later than originally planned due to the icy morning roads and made decent time but slower than normal due to hauling the farm car behind us so I would have something to drive while in FL. While I give Jaime (my groom) and Jen (my vet) a break and they eat dinner, I lay in the back of the horse van centered between my two horses. 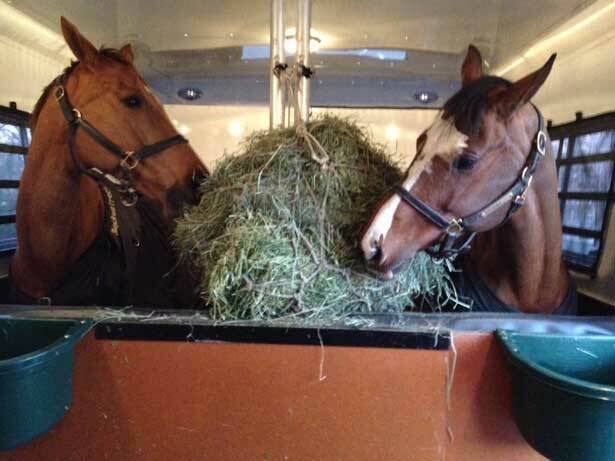 They stand quietly eating in their box stalls and where they would sleep over night in the hotel parking lot. A bed of hay bags and pads and sleeping bags simulate the feeling of the princess and the pea. I’m elevated on the hay so, in between chewing and drinking, the horses would put their head over the stalls and softly nuzzle my legs checking to be sure I was ok. Comfortable echoing sounds of the horses munching hay and drinking, paired with the foreign noises of police sirens and cars passing playing loud music, make it clear we are no longer at the farm. Tomorrow is another day. We depart early for our final 5 1/2 hour drive to Ontario, CA. An uneventful but enjoyable day. With three very near misses with insane truckers trying to make their deadlines early on a Monday morning, we find ourselves nearing our final California stop. Unfortunately there were high wind warnings which slowed traffic significantly. When we finally arrived and pulled into the the stalls at Hubbard Horse Transport, everything was ready and the horses – after traveling beautifully and tolerating the horribly unkept roads – were ready to walk and stand on firm ground. An hour later it was beer, pizza, and bed. 3:00am would arrive quickly! The alarm came early. We hopped in the van and back to the stable to prepare and transport the girls to their flight. We arrived to the airport exactly on time. After passing through the TSA and airport security, we drove onto the tarmack next to the aircraft. 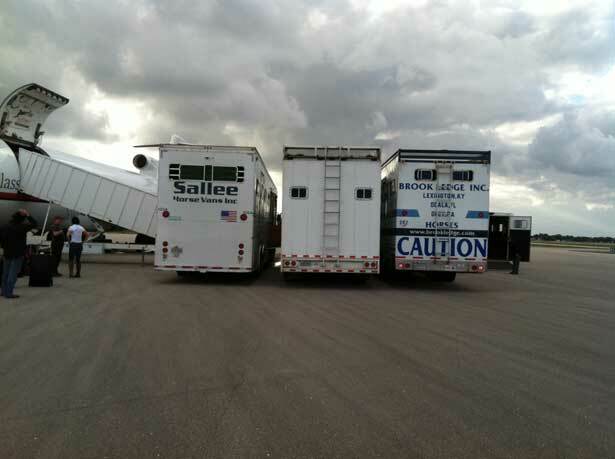 We unloaded our tack trunks into the cargo, then waited along with the various other trailers, horse vans, and trucks. The girls were stellar marching right up the ramp onto the plane and stood perfectly while stalls were constructed around them. Verona and Alexiss are flying Business class (stall + 1/2 and in coach single stall). My vet Jen Saunders and I are flying cargo. (Something is wrong with this picture!) We waived goodbye to Jaime who left us and started his drive cross country in the van with all of our supplies for the Winter. Verona is a seasoned flyer after our multiple travels to Europe to compete. Alexiss, however, is a first time flyer and you never know what to expect. It can be very stressful if they don’t accept the environment. Lexi was doing perfectly but when the pilots prepared for taxi and started their engine check the horse next to her became frantic! He tried everything to sit down in the stall and it sounds bad because it is. Lex held herself together but when the grooms were yelling out orders out to each other to help the distressed flyer she started to lose it. She hates to be yelled at. Fortunately the stall in front of her was vacant so the grooms took quick action to get her moved forward to the next container. Now Verona was directly in front of her and dressage Olympian Steffen Peters’ Grand Prix mount Legolas was her new stable mate. The two became instant friends as Lexi ignored the disruptive passenger. They shared a hay net the remainder of the flight looking much like the two dogs in love on Lady and the Tramp slurping strings of spaghetti. We have 16 horses on board today and Little Rock was a scheduled stop. Unfortunately for the stallion that was booked for that drop, he is now coming with us to Dallas due to freezing rain in Little Rock. He will need to travel by ground the remainder of the way when weather clears. Besides the four dressage horses, there were two famous race horse stallions, thoroughbred mares traveling to be bred, as well as two containers of polo ponies destined for Palm Beach, for a total of 6 containers. Mostly a plane full of beautiful horse flesh. Before Sept 11th, we had fewer regulations and could take off and land standing with our horses, but ever since then we need to remain in our seats in back until we are in flight. It’s ok because we have fun meeting and sharing stories with the other owners and grooms. Famous, not so famous, and soon to be famous people. Landing in Florida is a pleasure after leaving the farm and freezing temperatures. It’s 83 degrees. Deplaning on this aircraft is a fascinating process. Three large horse transport vehicles line up at the bottom of the ramp. The procedure is basically for the horse to walk down the ramp through the transport and directly to the pick up hauler. This way there are no loading issues for the horse and is very time efficient. Because my girls were in the front cabin they came off in the first group and our driver greets us, loads us up including our tack trunks and luggage, and we’re off for the 3 hour drive north. Jennifer rode up front with the driver navigating and I rode in trailer tending to the girls. The transition from 20-80 degree weather was wonderful. Loving riding with the windows open and fresh air. Even the horses destressed and rode perfectly, enjoying the warmth on their faces. The haul north flew by but it was dark here at our arrival. As we approached the farm, I see 6 girls and David are standing with big smiles awaiting our trailer and tack to help unload and tend to our every need. Moments later, Anne hops out or her car and greets us with hugs and sighs of relief that we made it and are unscathed. It was a heartfelt welcome from all. I don’t remember much from that night as we had been up for hours and the hype of the entire 3 days travel was about to dissolve. 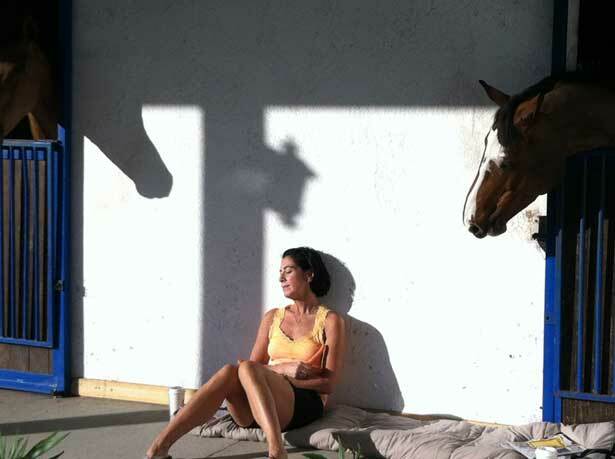 We were simply exhausted, so Jennifer checked the horses thoroughly and gave the thumbs up we could head over to my apartment and finally get some rest. It was however not to be. The excitement, the stress, and the anticipation of what lies ahead is keeping me awake. Completely worth it! It’s 7:00 and I poke my head out of my apartment and see my horses just 20 feet away from my front door. I wasn’t sure if I was awake or dreaming. The warm air of 76 degrees and the sound of beautiful music playing in the arena in front of me and sunshine on my door step make me strain to see if I can hear cherubs playing harps. My first thought is “Uh Oh” – I think I’m in heaven! We quickly get our work clothes on and head out to walk the horses. It’s warm and the feeling of relief knowing we made it safe and healthy accompanies our peaceful stroll. We walk the horses around the property, acclimating them to their new surroundings. The day was filled with working on diet for the girls. They will have very different hay/grain and the pasture grass is void of nutrients. Then it was time for some shopping for the apartment, followed by a little rest and some sun time. Later we walked the horses again and early to bed because there were still cobwebs in our heads from all the travel.